Hi again LJ! 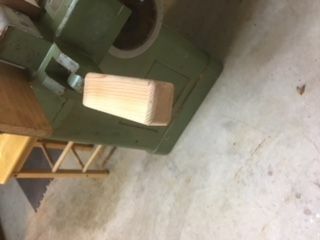 The plastic handle of my table saw broke so I decided to make a new one on the lathe using a scrap piece of Ash wood. I also decided to engrave my shop name with my new X-Carve. To add some contrast to this beatiful piece of wood I ebonized and finished it with a natural blended wax. I hope you enjoy it. Nice, functional and personal too. A- 3 time winning set. Looks great! I had to do the same for the handle on my Unifence after breaking the plastic one it came with. Hit the corners with a router screwed on and called it ready to use the rip fence. Yours is much nicer.